The beach is calling your name—your imprinted company name! 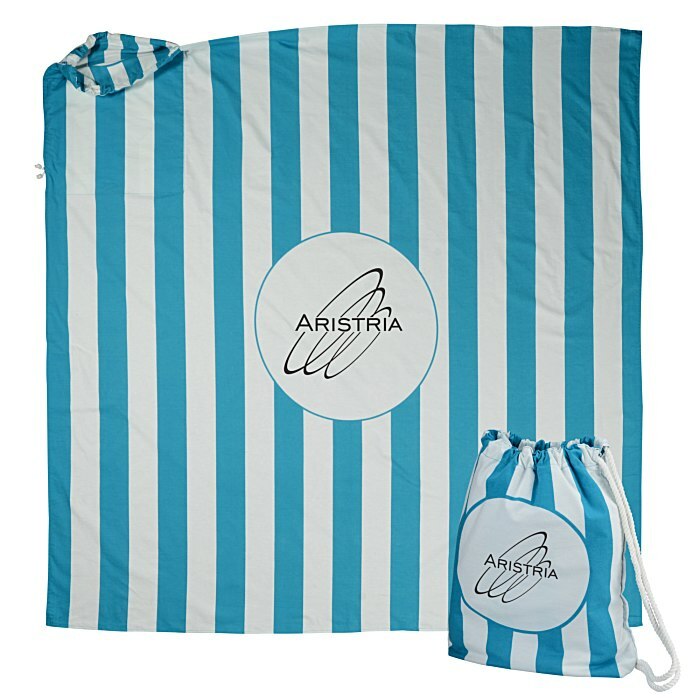 When your guests pop over for a picnic or lay out on the beach, this blanket will by busy promoting your business. Made of ultra-soft 100% brushed cotton flannel, a welcome spot to laze or stargaze. Invite a friend too—the huge 6' x 6' size provides enough room for two. The entire towel blanket folds into its own attached drawstring tote with drawstring handle. Comes with sand stakes to hold down the corners. Cabana stripes give the custom beach blanket an upscale look. Personalized blankets are perfect for your gift shop, beachside resort, hotel or other travel destination. Your price includes the same one-color imprint in the center of the blanket and front of the tote.